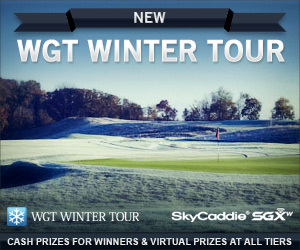 Don't miss the last month to enter into the WGT Winter Tour, brought to you by SkyCaddie. Over 50 prizes are being given away to players at all tiers. The Top 100 scores from the March Qualifiers will play for the March Championship, and the Top 10 scores will each win a $100 Amazon gift card. Seven lucky players will be selected at random in a Sweepstakes drawing (1 player from each Tier: Hack, Amateur, Pro, Tour Pro, Master, Tour Master, Legend) and get a dozen free NIKE virtual golf balls. Additionally, 1 lucky Sweepstakes winner will receive a free SkyCaddie SGXw course mapping device. Congratulations to our February Qualifier winners in the WGT Winter Tour! *See tournament rules for details and eligibility. Carved out of the mountain slopes in British Columbia, this magnificent golf course is the latest from TruGolf. With improved course quality based on WGT player feedback...check-out the realistic trees, water and grass. 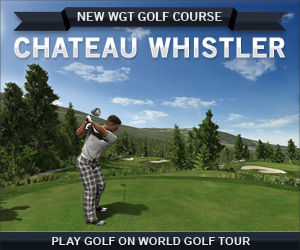 WGT is running a special free tournament on Chateau Whistler in March, and Closest-to-the-Hole games are also free, while Strokeplay games are 40 credits for 9 holes and 60 credits for 18 holes, on the Chateau Whistler and Cabo del Sol courses. *See tournament rules for details. Tiger Woods finally broke his career-long, two-and-a-half-year dry spell at Bay Hill Club on Sunday to win the 2012 Arnold Palmer Invitational. The former No. 1 player in the world last won an official event on the PGA Tour in September of 2009 at the BMW Championship. This week's win was his 7th at the Arnold Palmer Invitational and his 72nd career victory. It's also Woods' first win since he and swing coach Sean Foley began working together in the summer of 2010. Bay Hill was challenging, especially on Sunday with high winds and tough hole locations, resulting in an average score of 2 over par. After three rounds of 69, 65 and a 71, Woods began the tournament on Sunday in the lead at 11-under par, one shot ahead of Graeme McDowell and three shots ahead of Ernie Els and Ian Poulter. McDowell doubled-bogeyed the par-4 first hole to give Woods a three-stroke lead out the gate. McDowell eagled the par-5 sixth hole to make up for his terrible start, but he laid up into a bunker and made bogey on the par-5 12th hole, failing to put pressure on the leader. After losing his tee shots right and into fairway bunkers on the 10th and 15th holes, Woods saved pars with a long two-putt and a par putt from 15 feet. Woods finished with a 2-under par 70, a five-stroke victory over Graeme McDowell, to claim his win at the Arnold Palmer Invitational. All facets of Woods' game seemed to be coming together this weekend. This was his first tournament with all 4 rounds under par, and he's consistently hitting fairways and greens, shaping the ball, and making putts, as well as that mental toughness he's been known for. The 2012 Masters Tournament is just 2 weeks away, where Woods has won 4 times and Phil Mickelson 3 times. NOTE: Tournament host Arnold Palmer was taken to the hospital before the end of the final round, apparently due to high blood pressure from new medication. He spent the night at the hospital, but is reported to be fine and in no danger. As the second round of the annual Arnold Palmer Invitational came to an end today, Tiger Woods rose to the top of the leaderboard with a 7-under 65. Starting today’s round six shots behind first-round leader Jason Dufner, Woods puttied for birdie on every hole and made short work of the par 5s at Palmer's Bay Hill Club & Lodge in Orlando. A six-time winner of the event, Woods now sits at 10-under overall, just one shot ahead of Dufner and 2010 U.S. Open winner Graeme McDowell, who had a 9-under 63 today. Charlie Wi rolled in a 25-foot birdie putt on his last hole today in the tournament for a 4-under 68 to join Woods at 10-under 134. Justin Rose finished the second round at 6 under, one shot ahead of six players including Webb Simpson, Bubba Watson, Sergio Garcia and Vijay Singh. 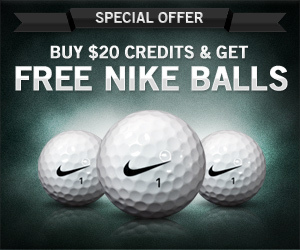 Get 3 free NIKE virtual golf balls when you buy $20 or more WGT Credits. These new top-performing NIKE virtual golf balls are yours free with this special offer, thru Sunday, March 25. NIKE's 20XI-X Balls feature a revolutionary RZN core that delivers more distance, as well as spin and control...plus a slower WGT swing meter. 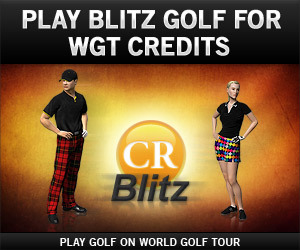 Use your WGT Credits to upgrade your virtual equipment, play in Ready-Go's and paid tournaments, or compete against your friends for credits in Matchplay Challenges, Skins Challenges and the latest Blitz Challenge games. * Unlimited offer available to WGT players buying $20 or more WGT Credits 3/22/12-3/25/12. Level 1-59 players receive 3 free NIKE 20XI-X (L48+) virtual golf balls. Level 60+ players receive 3 free NIKE 20XI-X (L71+) virtual golf balls. 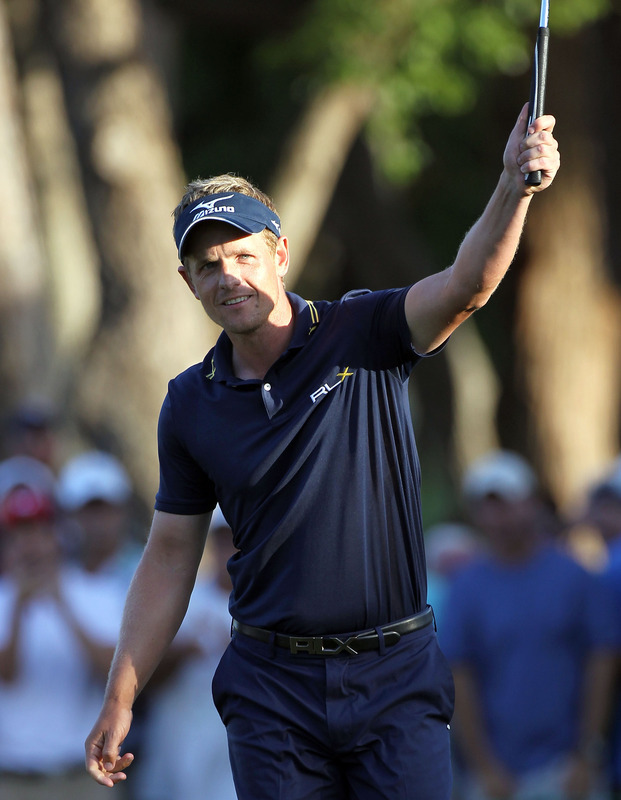 The PGA completed the Transitions Championship golf tournament at Innisbrook Resort in Florida. Heading into the final holes on Sunday, there were 6 players tied at -13. However, Ernie Els and Ken Duke missed short putts on the closing holes to both finish at -12, leaving Jim Furyk, Sang-Moon Bae, Robert Garrigus and Luke Donald all at -13 and into a 4-man playoff. On the first playoff hole, Donald had the worst tee shot in the group, short and in the left rough, but hit a strong 7-iron, just over the bunker to within 4 feet. The other players hit the green, but all missed their birdie putts, and Donald drained his for his 5th career PGA victory. With the win, Donald moved back to #1 in the world rankings, a spot he previously held for 40 weeks, displacing Rory McIlroy who held the honor for just the past 2 weeks, as McIlroy didn’t enter the tournament this weekend. Upcoming PGA tournaments are the Arnold Palmer Invitational and Shell Open, and then the Masters, the first golf major of the year. Donald joins the list of other notable favorites at the Masters, including McIlroy and previous champions Phil Mickelson and Tiger Woods. Enter for your chance to win a trip to Myrtle Beach and play golf with Blair O'Neal. One lucky winner will receive a four-day, three-night golf weekend for two people in Myrtle Beach, South Carolina, known as the Golf Capital of the World. The winner and a friend will spend the weekend golfing in Myrtle Beach, and then play in the “Monday After The Masters” celebrity golf tournament with professional golfer, model and new host of "The Myrtle Beach Golf Buzz" Blair O’Neal, plus attend the “Hootie & Friends” celebrity concert that night! *Eligible to residents of USA and Canada. Event 4/7/12 – 4/10/12. See contest website for rules, eligibility and prize details. To celebrate St. Patrick's Day, we're giving away 1 free WGT Green Ball to everyone who logs in and plays WGT on St. Patrick's Day (3/17). Get more distance and control with these festive WGT GI-SD vapor balls...plus a little luck of the Irish! Happy St. Patrick's Day from WGT! *Offer available only to WGT players who login to www.wgt.com on March 17, 2012, receive 1 free WGT Tour GI-SD Vapor Ball virtual golf ball in the color lime. Today marks the beginning of the 2012 PGA Transitions Championship at Innisbrook Resort's Copperhead Course in Palm Harbor, Florida. Over 140 players take the field for a $5.5 million purse at the 7,340-yard Copperhead Course, a par-71 track that annually ranks as one of the most challenging tests on the PGA Tour. 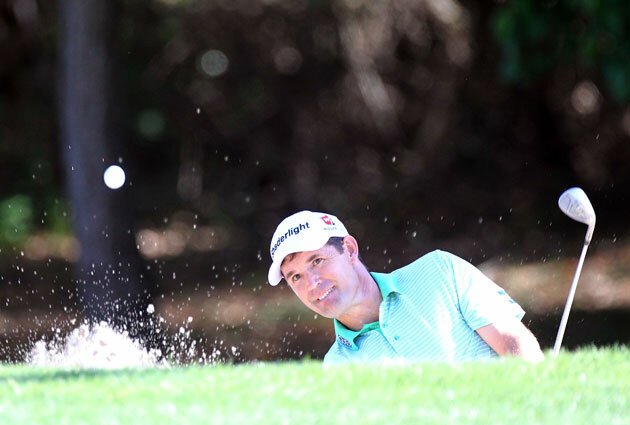 In round one of the tournament, Padraig Harrington shot the lowest official score of his life, a 10-under 61, to set the course record in the championship today. In fact, Harrington broke the Copperhead Course record, held previously by Mark Calcavecchia and Jeff Sluman. It represented the lowest first-round score on tour this year, relative to par. Right behind Harrington are Will Claxton, who finished 7-under 64, and John Senden, who finished today with 5-under 66. Senden has a history of playing well here with a tie for 15th last year and back-to-back runner-up finishes in 2007 and 2008. Finally, tournament defending champion Gary Woodland shot a 3-under 68 to close out the day. Enjoy new Blitz Challenge games, the new TruGolf course Chateau Whistler, new high-level PING G20 virtual clubs, and the new Block Player option…plus, the 2012 Virtual U.S. Open is right around the corner! WGT Blitz games are 9 closest-to-the-hole shots with dynamic scoring bonuses that keep matches exciting down to the last shot. Now you can play new Blitz Challenge games against 1-3 other players for WGT Credits. It's winner-take-all from 25 to 2000 credits per game. Carved out of the mountain slopes in British Columbia, this magnificent golf course is the latest from TruGolf. Play all 18 holes strokeplay on Chateau Whistler, and be sure to check-out the latest TruGolf technology in the images of the trees, water and grass, all based on WGT player feedback about Cabo del Sol. 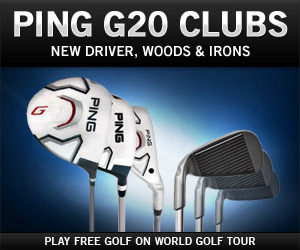 The latest technology from PING, the new PING G20 clubs, now available for top players. These new virtual clubs start unlocking at level 81, and include a new driver, woods, irons and a discounted full set…all with solid overall distance and control, as well as a slower WGT swing meter. WGT has a great community, but you might not want to hear from EVERYONE, so now you can use the new Block Player option on your Account page. 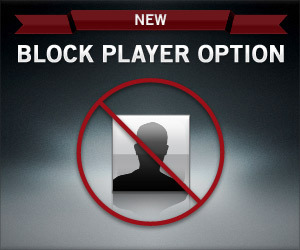 Blocking a player removes the ability for that player to invite, friend, challenge, or message you on WGT. 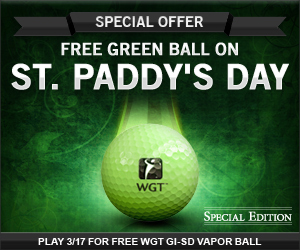 To celebrate St. Patrick's Day, WGT is giving away 1 WGT GI-SD virtual ball, in green of course, to everyone who logs in on 3/17 and plays WGT on St. Patty's. Get more distance and control...plus a little luck of the Irish! 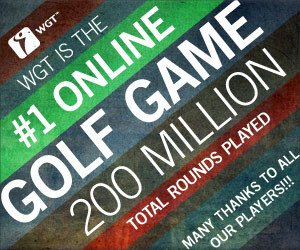 WGT is now the largest online golf game, as over 200 million total rounds of online golf have been played on WGT.com. Our sincere thank you to all WGT players for continuing to spread the word to friends. Your support enables us to keep adding new courses, features and equipment to grow the game. Next milestone…the over 500 million annual rounds of golf that are played in the real world. 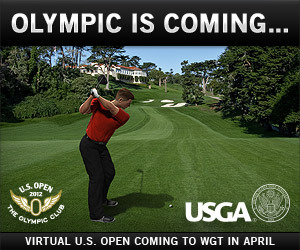 WGT is excited to host the 2012 Virtual U.S. Open, played at The Olympic Club in San Francisco. The course, only miles from WGT Headquarters in San Francisco, is absolutely stunning and very challenging. Other improvements include ability to save Replays in multiplayer games, and upgraded database servers for supporting more players in more countries.